The Swanage area has always been famous for its Purbeck Limestone, and during the 19th Century the quarrying of this stone formed the basis of the local economy. Originally the quarried stone would be taken to the shore and loaded onto small, shallow draft vessels. Once laden, the small craft would sail offshore to where the larger ocean-going ships lay at anchor. The stone would then have to be transferred again, before being shipped around the coast to various parts of the country. In 1859 Parliament passed the 'Swanage Pier Act', which authorised the construction of a wooden pier to a length of 750ft (227.2m), thus making it long enough to allow the stone to be loaded directly onto the large ships. The original Swanage Pier was constructed in 1859/60 by James Walton of London for the Swanage Pier and Tramway Company. 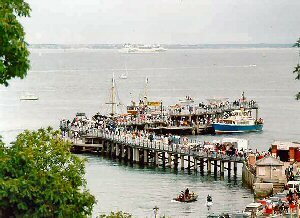 When George Burt started a steamer service between Swanage, Poole and Bournemouth in 1874, the Pier was being used for day-trippers as well as stone cargo, it soon became clear that the Pier was unable to cope with the ever increasing traffic and it was decided a new and longer Pier was needed. The new (present) pier opened to traffic on March 29th 1897. During the Second World War, Swanage Pier was sectioned for fear of a German invasion, and was not re-opened until 1948. At this time the old wooden pier was being used only by local clubs as a diving platform, and soon closed. The remains of its timber piles can still be seen to the east of the surviving pleasure pier. Steamer traffic ceased in the 1960s, with the PS Embassy making a final call on 24th September 1966. For the next 20 years Swanage Pier was allowed to fall into a state of dilapidation. In 1994, the Swanage Pier Trust acquired control of the Pier Company, with the aim of keeping the Pier open to residents and visitors and providing for its eventual total restoration. The Trust immediately set about raising the £1,000,000 required to save and restore the structure. Swanage Pier again plays host to visiting pleasure cruisers, including the famous PS Waverley and MV Balmoral. Diving organisations use the pier and it is a popluar venue for fishermen. The Pier Master is a volunteer among the many others who man the gates and operate the Pier Shop and Exhibition. The Dorset Belles are a ferry company based at Bournemouth Pier, which operates summer only passenger cruises between Bournemouth, Swanage and Brownsea Island. This service uses a small jetty a few metres west of the Pier (contact tel: 01202 558550).